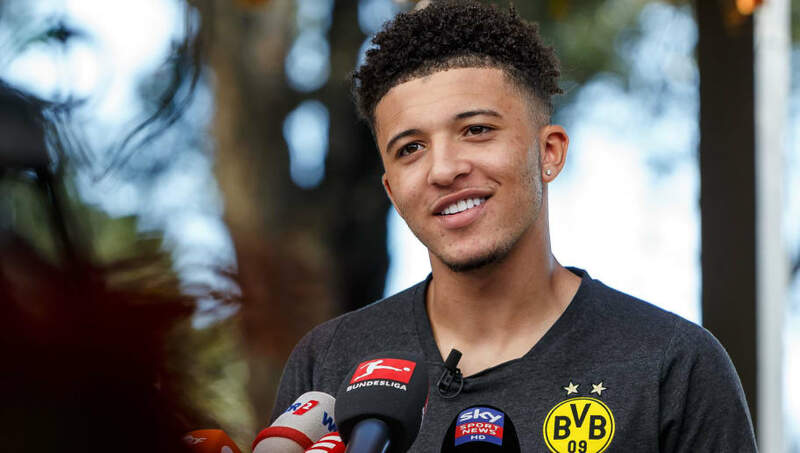 ​Borussia Dortmund starlet Jadon Sancho has admitted that he encourages other young English players to follow in his footsteps and find success in the Bundesliga. Sancho has enjoyed a remarkable rise to prominence as one of the finest young talents in European football since completing a move from Manchester City to the German top flight in 2017. Still only 18, the winger has scored seven goals in 29 appearances for ​Dortmund since completing his bold move to the Signal Iduna Park. Answering a question for German television, via ​Daily Mail, Sancho said in response: “I’m not a star! I’m just getting started! “Going abroad wasn’t really a thing, as from young I’ve always been away from home, so I was comfortable [after moving to Dortmund]. Sancho moved to Dortmund in search of greater first team involvement than he had received under Pep Guardiola at previous club ​Manchester City, having struggled to make the breakthrough into the senior setup at the Etihad Stadium. The young winger made just three appearances for Dortmund’s youth side after joining the German side before advancing swiftly into the first team, and Sancho’s career has been rapidly on the rise since. The forward’s form in Germany even earned him a call up to Gareth Southgate’s England setup and has now earned three senior caps for his country. The likes of ​Arsenal’s ​Reiss Nelson and ​Ademola Lookman of ​Everton have also enjoyed strong career progression during loan spells in Germany, and Sancho admitted that he may look to encourage the likes of ​Chelsea’s Callum Hudson-Odoi to make similar moves. Responding to a question on whether he could tempt the Chelsea starlet to Dortmund, Sancho responded: “I’m not sure! I could try to speak to him! Everyone has different pathways. Me and Callum are close friends. I know what he’s all about. Speaking on his advice to other young English stars looking to make similar progress, Sancho added: “I’ve told them that this is a league that is keen to express the youth. “Coming to Germany is not easy. People might think it’s easy because I’m doing so well, but it’s not at all. With Reiss Nelson currently on loan at Hoffenheim from Arsenal, Callum Hudson-Odoi could be set to become the next young English forward to follow in Sancho’s footsteps in moving to the Bundesliga, though ​reports suggest that the Chelsea forward will join Bayern Munich.